When one of my boys is sick, my "mom" instincts kick in and I do what I can to help him feel better. Sometimes this includes chicken noodle soup made from scratch and a few extra hugs. But when fevers don't break, over-the-counter medicine is ineffective and extra rest and fluids don't make a dent, I turn to my pediatrician - especially if I suspect something like an ear infection, strep throat, or bronchitis. Antibiotics are a very important tool in fighting off nasty bugs that are bacterial in nature. A prescription, of course, will include directions for the size of the dose and the length of time for dosage. We follow these directions carefully to get our kids back to health. Livestock antibiotic label. Antibiotics are used with the advice of a veterinarian. Withdrawal periods must be observed prior to animal entering the meat supply. 1. Is all meat is antibiotic free? Yes! Lately I’ve seen “antibiotic-free” labels on meat and poultry. However, ALL meat with the “USDA” label is tested, inspected, and free of antibiotics. Anyone who uses an antibiotic to treat livestock has to follow strict rules. Each antibiotic has a specific withdrawal time, and a treated animal is not allowed to enter the meat supply until that time has passed. The withdrawal time indicates how long it takes an animal to completely process the antibiotic out of its body. You can be assured all meat and poultry are free of antibiotics – it’s the law. 2. Why are antibiotics used in livestock? Just like humans, sometimes animals get sick. Disease or injury can cause an infection, and antibiotics are an important tool in animal health. We need to be able to treat them, help them recover, and keep them comfortable. Ultimately, a healthy animal translates into healthy meat for my family and yours. For more information about how and why antibiotics are used in livestock, here’s a great video from Best Food Facts by Hip Foodie Mom. 3. Are veterinarians consulted in administering antibiotics? We’ve always used the direction of a veterinarian to determine what kind of medicine will achieve the best results in a sick or injured animal. A close working relationship between livestock producers and these important professionals has always been considered a best practice. To clarify this, as of January 1, 2017, the involvement of a veterinarian is required by the FDA to write a valid VFD (veterinary feed directive) in the context of a VCPR (veterinarian-client-patient relationship). 4. Who uses more antibiotics – people or livestock? 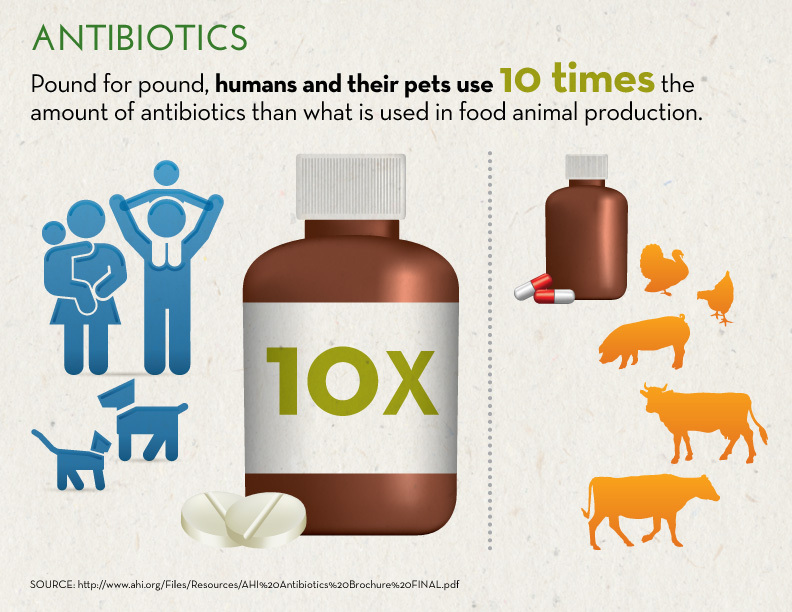 Actually, people and pets use ten times more antibiotics than what is used in raising livestock. 5. I’ve heard that antibiotics are used to promote growth in livestock. Is that true? While it was discovered decades ago that antibiotics can influence efficient growth, this has been discouraged and is not a modern practice. Animal health companies were asked to voluntarily withdrawal labeling of medicated feed for growth, and they unanimously complied. Occasionally, animals will be fed a medicated feed, but it is only under times of immune system stress to prevent disease and reduce the amount of antibiotics that will be needed in the long term. Stress can occur during weaning or after being transported; medicated feed may be used during those times. However, it is important to note that the antibiotics in the feed are given in the context of animal health to prevent and address illness, not as a growth promoter. New FDA Veterinary Feed Directives address this, and veterinarians always oversee antibiotic use in livestock. 6. Are “superbugs,” or antibiotic resistance the result of antibiotic use in livestock? No. The majority of antibiotics used in livestock are not labeled for human use. There has never been a proven case of antibiotic resistance due to livestock antibiotic use. Informational videos can be found here. 7. How do livestock producers reduce their use of antibiotics? We strive to prevent illness and injury by providing optimum nutrition, unlimited access to water, plenty of room, appropriate housing, and good animal handling practices. This keeps our animals as healthy as possible and keeps stress to a minimum, which reduces use of antibiotics. This medicine is also expensive, so good animal care also helps our bottom line besides being common sense.